420 West 42nd Street is one of Manhattan’s most distinguishable luxury rental buildings; deep in the Theater District, it stands 41 stories high, with a façade of black and white stripes running up the building, which has earned it the nickname “The Zebra.” But this zebra-looking piece of luxury Manhattan real estate is no joke. It was built in 2001 in a modern design, which focuses on spacious rooms that offer residents maximum comfort. Outside 420 West 42nd Street, residents find themselves in the up-and-coming Clinton neighborhood, near several off-Broadway theaters that give the area its name. The building is also just a short walk from Broadway itself, as well as Times Square, the Hudson River, and countless bars, shops and restaurants. These apartments for rent in Manhattan, with their flair, location, and conveniences, should have no trouble catching any New Yorker’s eye. The rooms in 420 West 42nd Street visions of comfort, with high ceilings, oversized walls and river views, but the numerous amenities are equally accommodating. A concierge is on hand for all residential needs, as is a lobby attendant. The building comes equipped with a fitness center, bike room, and several laundry rooms. 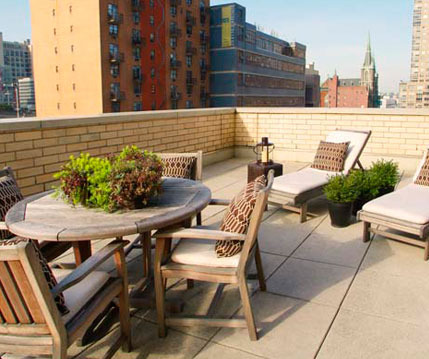 A roof deck is also available, offering residents a place to spend time with friends. The building also provides a valet service. 420 West 42nd Street, or The Zebra, is visually a standout Manhattan building, and it is clear through its commitment to luxury, that is a standout in other ways as well. 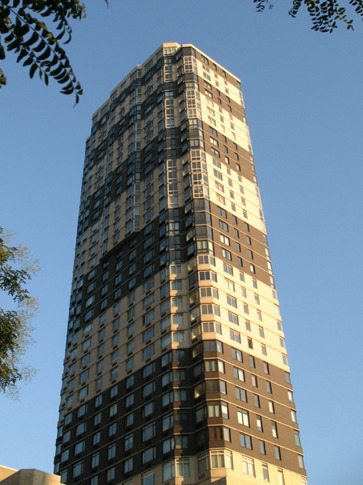 I would like information on apartments in 420 West 42nd Street. Please contact me ASAP.